First off, I guess I should confess that I have never been what you would call a "beginner camper." I was about 4 months old when my parents took me on my first camping trip. As I was growing up, I went camping with my family at least once every year. As a teenager I attended a 5 day long church camp for girls for eight years in a row. I even went to a special outdoor camp at BYU-Idaho twice. My husband and I go camping at least twice a year. Having kids didn't diminish my love of camping. Each of my four children have been camping at least once before they turned 7 months old. I don't remember what it's like to camp for the first time, but I do know a lot about how to have a successful camping trip. I'm hoping I can pass on some of what I know to those of you who may be new to camping. What is the point of your camping trip? Are you visiting a special landmark, experiencing nature, hanging out with family/friends, and/or trying to avoid the cost of a hotel? The type of trip you are planning will determine where you should put your efforts. For example: If you are looking forward to some quality time with friends you are going to want to make sure you have plenty of wood to keep the campfire burning while you stay up late and talk. On the other hand, if you are visiting a landmark you'll probably spend more time sightseeing than sitting around your campground. Figuring out expectations ahead of time can help you avoid a lot of stress later. I suggest talking the trip over with every member of your family to make sure you are all on the same page. It would be awkward if you envisioned hiking 6 miles in one day while your spouse was interested in lounging in a camp chair and reading a book. And while we're talking about expectations let me tell you a little secret: camping is A LOT of work. There is a tent to set up, food to cook, water to boil, garbage to throw away, sleeping bags to unroll, fires to make, etc. Even going to the bathroom usually involves a long walk down the road to what ever facilities are available. Make sure you discuss the work assignments with everyone who will be in your group. If you are new to camping it can be a little daunting to decide where to go. 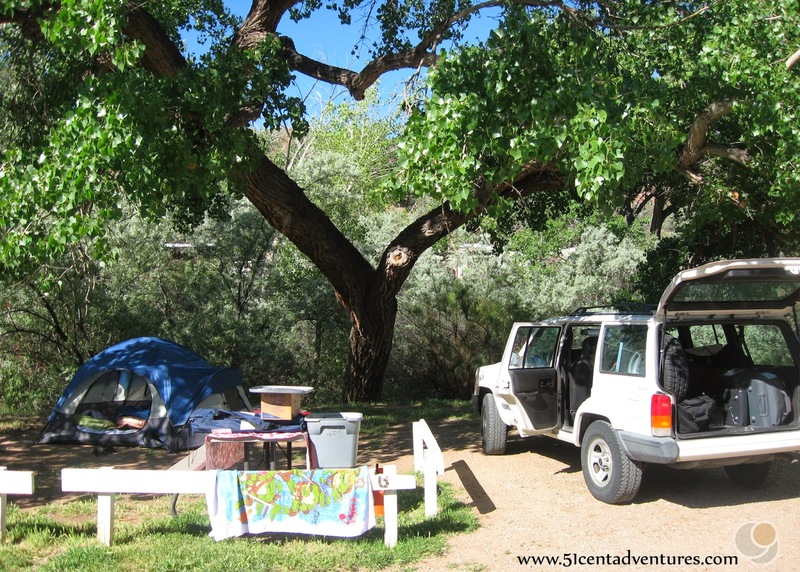 Campsites basically fall into three categories. Prices and amenities vary by campground, but generally you will pay about $20 per night. 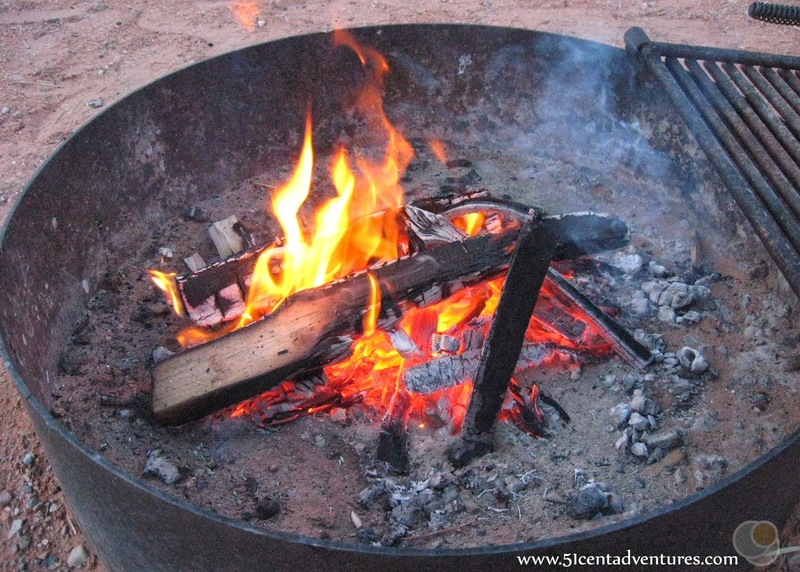 You will usually get a campsite that has a picnic table, a spot for a tent, and a fire pit. Keep in mind that you might have to pay some fees on top of the cost of the site. Some campgrounds will require you to pay a reservation fee. State parks, national parks, and some other areas will require you to pay their entrance fees in addition to paying for the campsite. 2. Private campgrounds: These are campgrounds that are owned by a person or organisation. KOA kampgrounds are probably the most well known. Some private campgrounds show up on reserveamerica.com, but I've found it is also helpful to google "tent/rv campgrounds in (certain area)." These campgrounds usually have more amenities than publicly owned campgrounds. That makes them more expensive. However, it can be worth the extra cost if having access to wifi, showers, a pool, laundry facilities, a store, etc is important to you. 3. Back woods/primitive camping: If you are a beginner camper I think you should steer clear of this type of camping for now. The only amenities are the ones you bring with you. 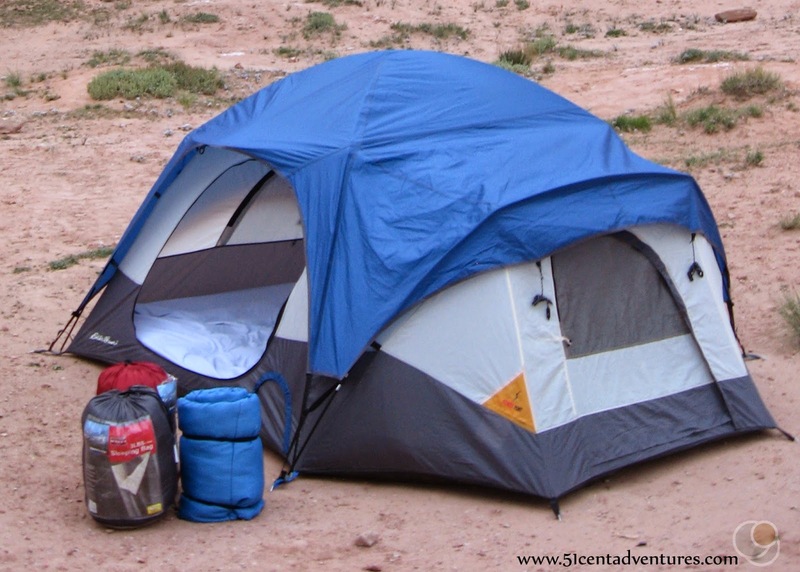 Make sure you are okay sleeping in a tent before you embark on this type of adventure. But just so you know, there are places you can camp either for free or for the cost of entering the park/wilderness area. You can usually only find out about these places through word of mouth. So ask your friends, talk to park rangers, google things to do in certain areas, etc. Some areas require permits before you can do back woods camping in them. Make sure you are in an area that you are allowed to visit. There is virtually an unlimited amount of camping gear you can buy. If this is your first time camping I suggest just borrowing most things from a friend. That way you don't invest a lot of money into something that you may never do again. Here is a packing list of the basic things you will need. 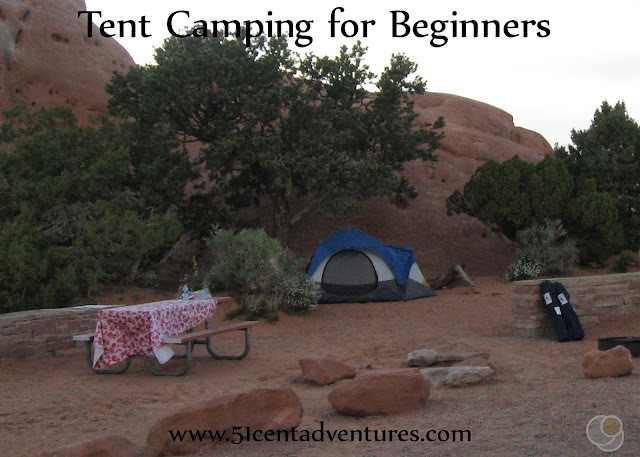 Whether you own a tent or you borrow it, you should practice setting it up before you go camping. Tent technology has improved a lot over the years, but getting the correct poles into the correct places can still be a daunting task. The last thing you want is to have your whole family waiting for you to figure out the tent. If you own your own tent take advantage of the "practice run" to water proof your tent. You can find cans of water proofing spray at most stores on either the camping aisle or in the shoe section. Spray the water-proofing stuff on all the seams of your tent and let it dry. If it starts to rain during your trip you will be very grateful you took the time to do this. 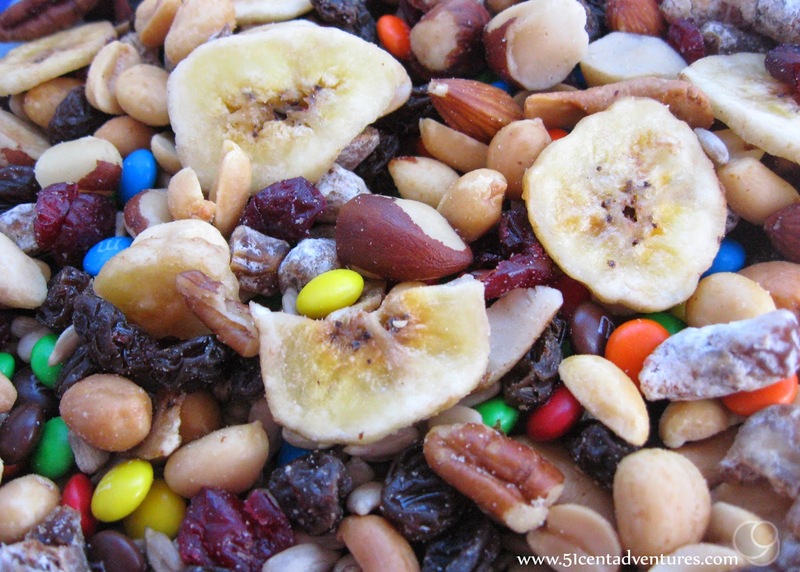 When you are camping you don't want to store any food type things in your tent. This includes everything from snacks to deodorant - pretty much anything that smells good. Little (and big) animals will want to find it and eat it. They wont have a problem chewing through your tent to get to the food. I don't care how easy Pinterest says it is, your first camping trip is NOT the time to try to cook your first dutch oven meal. It's not the time to cook anything you haven't tried cooking at home. Here's the thing about cooking and camping. Imagine you are in your kitchen at home, but the fridge and all the cupboards and drawers are empty. Everything you need to use is piled into a cooler and a box that you packed several hours ago. Did you remember to pack a cutting board? What about a carrot peeler? And oh yeah, you have to walk at least 10 feet to fill up a container of water. Not to mention that there is dirt everywhere. On top of all that, you better hope it's not raining. Do you get the picture? Cooking while camping is difficult. Do yourself a favor and go easy on the cooking. If that seems like too much of a cop-out then here are some other options. 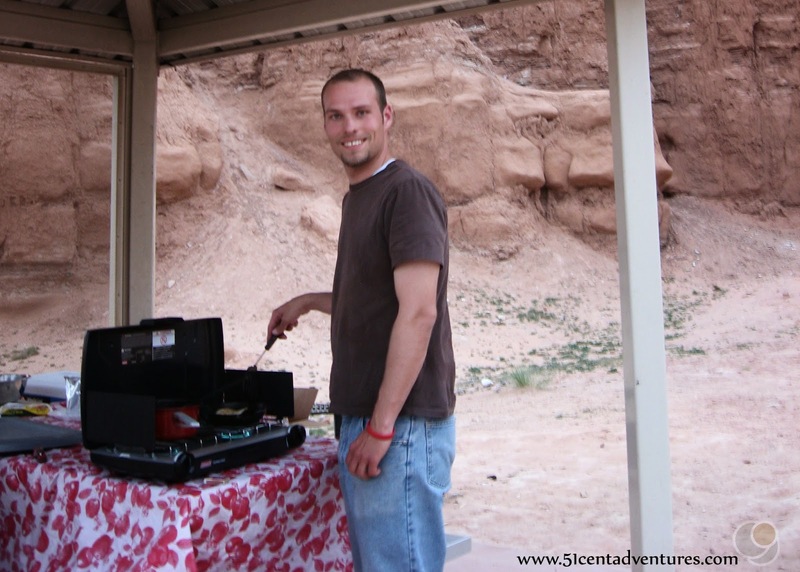 Pasta and sauce - this is one of my favorite things to eat with my family when we are camping as part of a road trip. Just boil water, cook the pasta, heat up the sauce, and mix. Canned Stew, Chili, or Soup - preparing food doesn't get any easier than opening up a can and heating up the contents. That is, as long as you remember to bring the can opener. Eggs - eggs can be a little bit of a pain to transport, but they are easy to cook. Bacon - if you can cook it at home you can cook it on a camp stove. Sausage - buy the pre-cooked kind so it doesn't take as long to cook. Pancakes - either pre-mix all the dry ingredients at home or just buy pancake mix at the store. Hot Cocoa - mornings are usually really cold! Bring along some hot chocolate so you can warm up. Oatmeal - I love packets of instant oatmeal. Just add boiling water and ta da - breakfast is ready. My husband and I don't usually eat lunches when we are camping. We've found that we prefer to just snack between breakfast and dinner. (More about that in a second.) If you are a lunch person here are some ideas. you've been on the road for a few days. 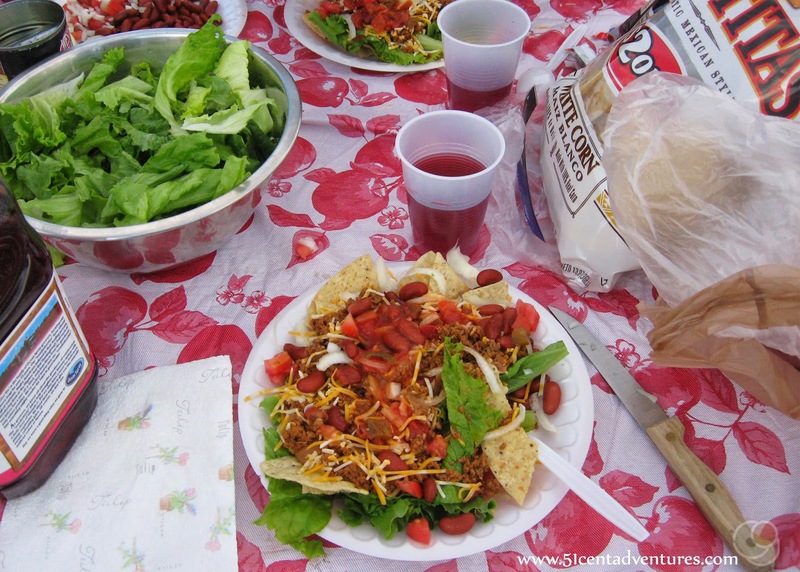 Taco Salad - this was a perennial favorite at all the church camps I attended as a teenager. It's nice because you don't have to actually cook anything. If you want meat with your salad then pre-cook it at home and then keep it cool in the cooler. Sandwiches - peanut butter and honey don't need to be refrigerated so they are at the top of my list for things to eat. Jelly is a close second. We never bother to refrigerate it when we are camping and so far we haven't noticed a problem. If you are just planning an overnight trip then lunch meat and cheese will probably stay cool enough in a cooler. One thing that makes camping so fun for my husband and me is that we allow ourselves to buy all sorts of goodies that we usually avoid because they are either too processed or too expensive. This is the time for nutty bars, capri sun, trail mix, jolly ranchers, soda pop, and anything else that we have been craving. And don't forget to bring along marshmallows, graham cracker, and chocolate so you can make s'mores. For heavens sake, do not, I repeat, do not bring along electronics to keep yourself or your kids entertained. One of the wonderful things about camping is the chance to slow down and enjoy the simple things about nature. Trees, bugs, birds, rocks, even dirt can all be a lot more entertaining than any movie, tv show, or song. Go on walks, draw pictures, go fishing, go hiking, throw rocks in a lake, make up a game, play cards, read a book, or just stay at the campsite and relax. There is one final thing I want to tell you. Sometimes there are moments when camping trips aren't all that fun. It rains, the nights get cold, the food tastes weird, air mattresses deflate, kids cry, the list can go on and on. When those things happen I find myself repeating the mantra: "it's just for one night." I tell myself that night won't last forever and eventually everything will be okay again. And without fail, the sun eventually comes up and everything seems better. So if things are a little rough on your first camping trip just tell yourself "it's just for one night." I promise you will get through it. You might wonder if all the work of camping is worth it. Let me tell you, IT IS! There is nothing like staying up late talking around a camp fire. Or waking up in the morning and hearing birds chirping two feet away. Or feeling a burden lifted off of your soul because you are miles away from everything that normally distracts you. No matter how uncomfortable your first camping trip might be, you might just find yourself thinking, "I want to do that again." I second Valerie's idea of practicing how to set up the tent before going camping. She came over once and showed me how to set up their little tent that I was borrowing for a women's church campout. It made all the difference between just giving up and sleeping in someone else's tent and having my own space in my own tent. Bamboo tent poles are Tricky!